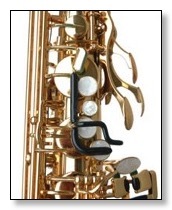 Hollywoodwinds Saxophone Key Clamps help keep the pads seated and in adjustment. These clamps are great for traveling from location to location and will help reduce the number of times the saxophonist will need to visit the repair shop. Always place the clamp on the keys first and gently bring the clamp around the body of the instrument. This will make it easier to place the clamp on the keys and keep the key clamps in adjustment. All saxophones are different, so a clamp set needs to be fit to each saxophone by bending the clamp. Older Conns are much bigger around than the modern saxophones. Older Conns and other vintage saxophones were designed to be inline on the finger positions, while most modern instruments are offset. Once the clamps are set for your instrument they will generally stay set. If you have a pad changed that is not the same size as the old ones the clamps may need to be set again. Hollywoodwind's Key Clamps have an improved rubber coating that covers the spring steel, preventing damage to the instrument and providing better fit. The clamps are now even easier to place on the saxophone.